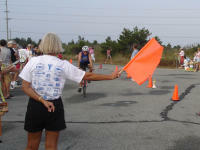 The last Triathlon that I had planned for the season was the sprint distance race in Dewey Beach. It was a 1 mile swim, a 15 mile bike, and a 3.4 mile run. I decided that this would be a good race to finish off the year with because it was at the end of the summer and at the beach!! I hadn't been to the beach very much all summer, so I figured I would make it a nice long weekend in Delaware. AD and I were going to have lunch in DC, the Businessman's Special at the Palm, and then we got on the road and headed down to Dewey. The traffic wasn't too bad and we made good time. Despite stopping at several gas stations that only had port-a-potties. We swung by the Bed and Breakfast that we were staying at to check in and drop our stuff off before heading to pick up my race packet and go check out the transition area. I didn't realize it was such a big race until I saw the number of people on the list at check-in! I wasn't too worried though, because it seemed like they had enough waves. They seperated the first timers, of which there were a good many, and the experienced. We headed down to check out the beach and transition area, and it didn't look too bad. The waves were pretty big that night, but would hopefully die down a bit overnight. There were lots of racks for all the bikes and a good spread out space. The course was a walk down the beach to the swim start, where we swam back to the transition area, jumped on the bike and went south on Rt. 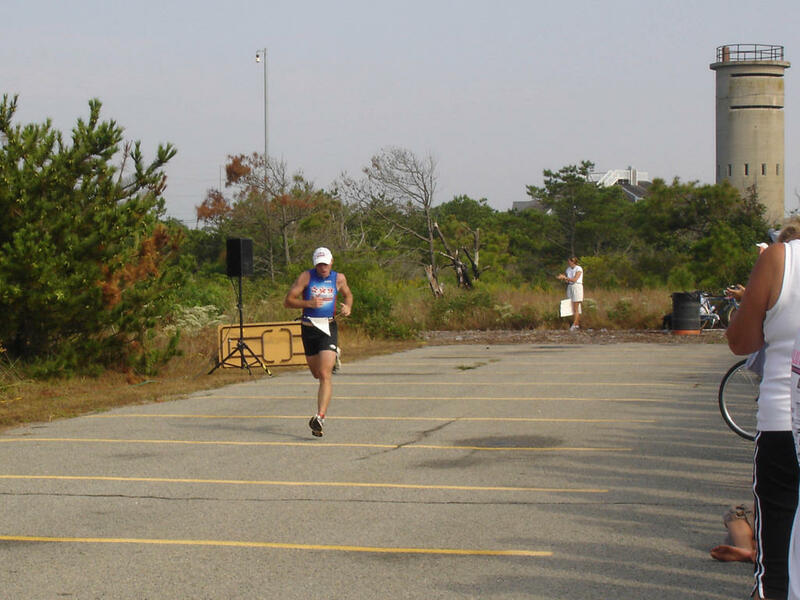 1, then came back north, and for the run, we ran north through Dewey and then back south to the finish line. All out and back and basically very flat. It was time for dinner, so we headed to this little place right in Dewey called Gary's Dewey Beach Grille. They were pretty good, but nothing I'd really recommend. The service was pretty slow, but they had big pasta and were pretty cheap, so that was a benefit. After that we headed on back to the B&B to get all my stuff ready for the next morning and to watch a movie. We ended up just finding stuff on TV and went to bed pretty early. However, that did not seem to matter when the alarm in the room decided not to go off. I guess I should have made sure I had set my own, instead of theirs. Fortunately, AD woke me up, and we were only running about 30 minutes behind schedule. Not a big deal. But when we went outside, it was drizzling... that was a bit of a bummer. It cleared up a bit and the clouds were starting to break as we walked down the beach for the swim. We walked about a half a mile down the beach, all 700 of us competitors. I was in the 5th wave, so I had the chance to watch a few people before I had to dive in and get going. I saw a friend, Robin, as we were getting our swim caps and goggles ready. It was almost time. 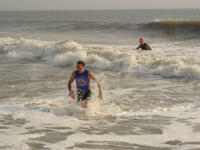 I was a little nervous about swimming in the ocean, just because I hadn't practiced much. Oh well, down the chute I went to corral on the beach and get ready for the horn. A lot of people had wetsuits, but I did not. I wonder if that really made a difference in the bouancy? Off went the horn and we ran down the beach and jumped into the waves. I got pushed back by one, and then pushed really hard to get out past the waves to the buoy, using up more energy than I should have so early in the swim. The waves weren't too bad once I was out beyond the buoy, but I was still moving up and down. I was told that we swam with the current, so that the swim wasn't so hard, but I was beginning to doubt that there was any current. It took me a while to get comfortable, and I think I went out too far and added some distance. Coming in to the beach felt good and the waves pushed me in, almost swamping me at one point. I was definitely ready to get on the bike. I feel like I had a pretty good transition. Not as fast as I could have gone, but also not the slowest. My bike was at the far end of where we came in from the swim and where we went out on the bike, so I had a bit of ground to make up. This was definitely my strong leg of the race. I jumped on after leaving transition and tried not to look back. I hadn't ridden the course before, but I knew it was an out and back with a bridge, the only "hill", so I wasn't too worried. I got down on my aero bars, got into a rhythm, and pushed it out. At one point I was passed by a 60 year old woman, and I felt really slow, but I was able to pace off of her and just convinced myself she was in amazing shape. Toward the last mile I decided to power it in and I passed her back! About the half way point I ate my goo packet and drank a bunch of water. I didn't finish my water bottle on the bike, but I came pretty close. 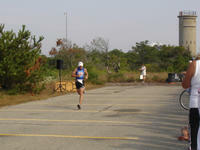 I sped into the transition area and I was ready to run! This was a good transition also. I ran back to my rack, almost knocking it over in the process, it was very unstable in one of the legs, but I saved it. Took everything off, put on the running shoes, more water, and off I went on the run. Could have been a bit faster, but good. Now I know why there were so many people at this race. They have a pretty good post-race party! Dogfish Head was there with a number of kegs of beer for us, on the house, and they had a bunch of good snacks, and it was a nice day. I came in 137th place overall for the men. They do not have the complete overall listings, so I am not sure how I stacked up there, but I think it was about 150th. For the men, I was in the top 35%, which isn't bad considering I wasn't too happy with the swim and really struggled on the run. I am lookinf forward to the next one! We ate and drank for a bit, chatted with Robin and her boyfriend, and then headed back to the B&B. Here is a link to the official phots that were taken: Photos Let me know if you think I should order any! There is more to come on the rest of our weekend, stay tuned! !